With the quality of smartphone cameras nowadays, why would anybody want a standalone camera? iPhones, smartphones, iPads. The last thing most of us want is another gadget to carry around. Why would anyone who just wants to take a shot of their friends being goofy to post to Instagram use anything but their phone? Oh, ye, followers of social media, I'm about to give you a reason to buy...an old-fashioned camera. 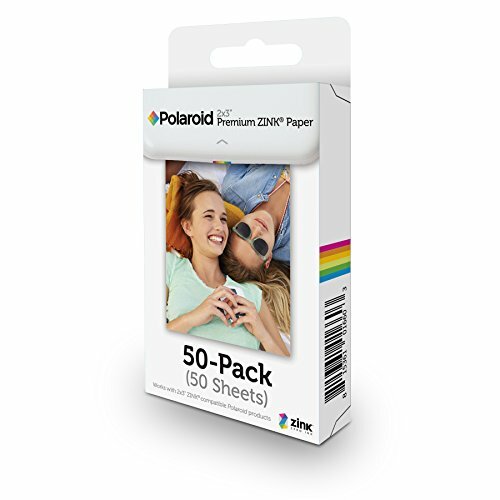 Polaroid has been around since pictures were being taken by little brown boxes at a time when social media was everyone sitting together on the front porch swapping stories. Back then, you had to physically take your film to a local drug store and wait days to get your pictures back. Sharing had a whole different but more personal meeting back then. An actual picture was physically given to your friends as a keepsake. Smartphones and social media may have killed the camera industry, but Polaroid has invented a camera that's fun, hip, and relevant. Best of all, it brings back the magic of an instant camera. A strange case of art imitating life imitating art. Everyone seems to be obsessed with Instagram because it’s an easy way to share your life in pictures without all the drama of Facebook. Most people don’t realize it, but Instagram was originally modeled after the old Polaroid instant cameras of the '60's and '70's. It pays homage to the old school cameras by squaring the photos off and giving users the ability to add different filters to make their pictures appear vintage and retro. 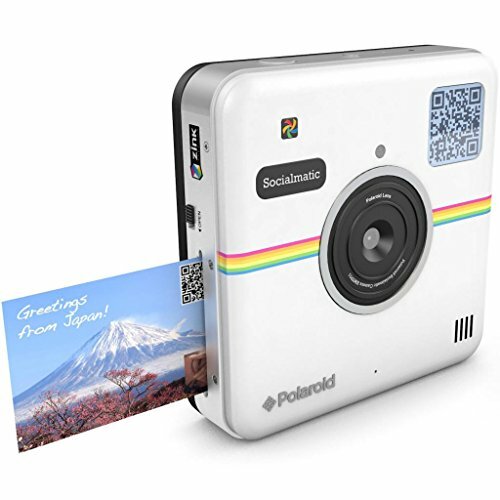 In 2015, Polaroid merged the instant camera and Instagram and created the Polaroid Socialmatic camera. It allows users to snap a picture, share it on Instagram, Facebook, Twitter, or whatever social network they're addicted to with built-in Android technology. But this is the 21st Century. And in this day and age we like to think we invent stuff the likes of which nobody has seen. Well, if you're under 35, it's likely you haven't seen one of these. Through the power of modern technology (with a little inspiration from the olden days) users can snap a selfie and then print it out right there in their hand. A camera that can print out pictures instantly. Who knew? A camera with bells and whistles than you can shake a stick at. 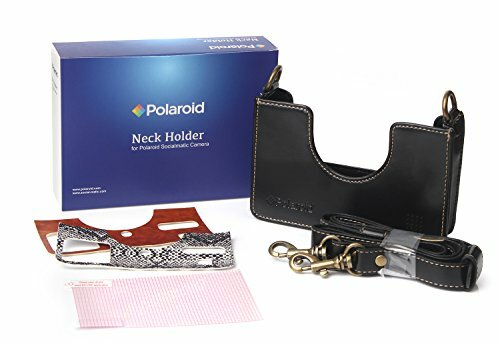 The Polaroid Socialmatic is a camera that combines the old school look of yesteryear with the cutting edge technology of today. At 1.2 x 5.2 x 5.2 inches, it’s an odd shape for a camera, square and thick, and not very ergonomic. It weighs in at 14.1 ounces, just slightly lighter than an iPad Air. But while it’s not as compact as a traditional digital camera, it’s extremely fun and addicting. The front facing 14 megapixel camera rivals most smartphones in terms of quality. And if you’re a selfie hog, the 2 megapixel rear facing camera will let you spread yourself, not only across social media, but get you into as many friends’ hands as you want. Literally. Pictures can be edited on the 4 ½ inch touchscreen that’s really more Android tablet-like. Instagram filters can still be applied to your photos, and the cool twist is it will print out your edited pictures just as they appear on the LCD screen. The Instamatic is not just a novelty camera that prints out paper pictures. It will save your photos like any standard digital camera. The camera has 4GB of on board storage that can be expanded to 32GB. What’s more, you can share your photos the modern way by posting them to your preferred form of social media right there from the touchscreen. The printed photos are 2x3 inches and have a sticky back that will let you physically post them to your wall. The photo paper is water resistant and smudge proof, which is something the vintage Polaroids never were. They're smudge and fade proof because there is no ink used in the printing process. But maybe the most amazing thing about this camera is that it can literally stalk whoever is viewing, sharing, or posting your photos by adding geo tags to them. Did you ever wonder who’s looked at your photos you share online and where in the world they end up? What does it take for a certain pic to go viral? When you use the Socialmatic to take and share your pictures online, it automatically embeds a QR code onto your photos. It then allows you to track your photos as they make their way through cyberspace. No ink, no mess, and no color fading. I like to think of these plates as a type of protective cell phone cover for your camera. It makes your instant camera a whole lot cooler looking than your standard digital camera, too. After all, once you have one of these cameras, you'll want to take it everywhere with you, so you'll need some kind of reliable protection against the occasional bumps, drops, and scratches that come with regular use. These are made especially for the Socialmatic camera, and it won't cover important areas like your microphone, ports, or flash. They're available in leather, snakeskin, and golf ball themes. Admittedly, this camera is a bit unwieldy. It's not easy to grab and go like compact cameras, but we don't care. It's just so darn fun. 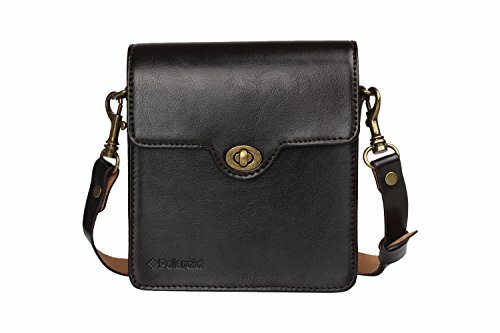 Luckily, Polaroid has made beautiful genuine leather cases to make carrying the Socialmatic easy and fashionable. The cases are form fitted to the camera, which eliminates any slips or bumps while you're carrying it with you. It also protects it from dust, so it's a good idea to store your camera in its case. Each case comes with an adjustable but detachable strap. Wear it over your shoulder, across your body, or carry it like a clutch. They do say if you wait long enough, everything old will be new again. Retro and vintage are hot now. People flock to thrift shops and yard sales to find what was hot and cool 30, 40 or more years ago. And while you might be lucky and find yourself an original Polaroid camera, it’s more than likely you won’t. 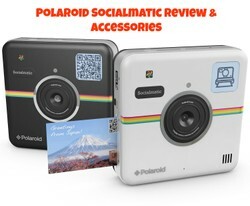 Why not get the next best thing by buying an Socialmatic camera? I remember the Poloroid Cameras when they first came out. You took the picture and the camera printed it out for you, but then you had a special acid that you had to wipe photo with in order to preserve it. Some phones take amazing pictures. They've come so far as far as their cameras go. I hardly ever use my regular camera, too. My cell phone is my go to camera. But I have to say, I never print my pictures out anymore. They're swimming around in my computer. Actual print pictures are becoming a novelty now instead of old fashioned. I find that I'm using my phone camera for just about everything, and I rarely even touch my camera. My phone has more megapixels than my camera. The Kodak Pixpro gives you professional quality photos, but is as easy to use as a point and shoot camera. Don't let money stand in the way of your hobby. Great cameras don't have to be expensive. A listing of the best cameras for flower photography under $50, $100, $200.